We have recently become the proud new owners of 6 teeny tiny fish. Of course this wouldn’t be possible without a tank of water. 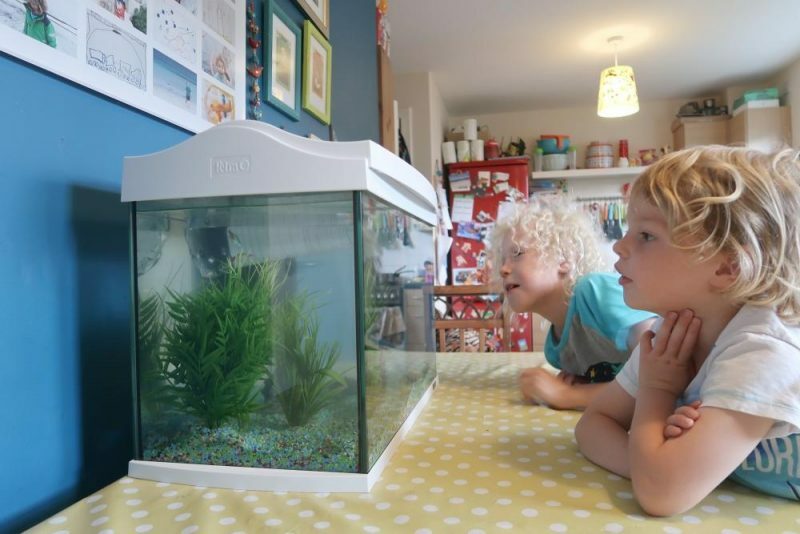 So we were very excited to receive the AquaArt Discovery Aquarium from Tetra, ready to prepare for our fishes arrival. 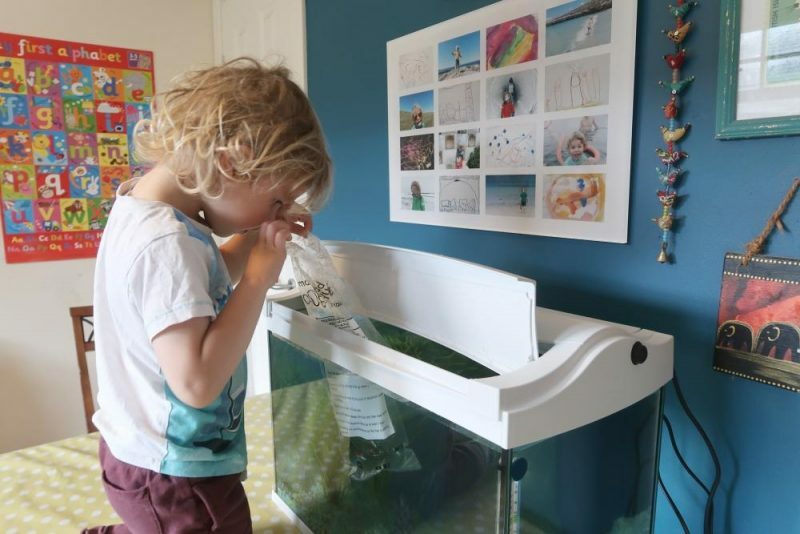 Once we have tidied up some other areas of our house and removed non essential pieces of furniture then it will probably find a better home on the stand the aquarium came with it. There’s even a cupboard in the stand to keep all your essential aquarium bits and bobs. When the tank first arrives it’s best to give it a quick once over to check for any cracks from transit, although I would be very surprised as ours was so well packed it wasn’t going anywhere! 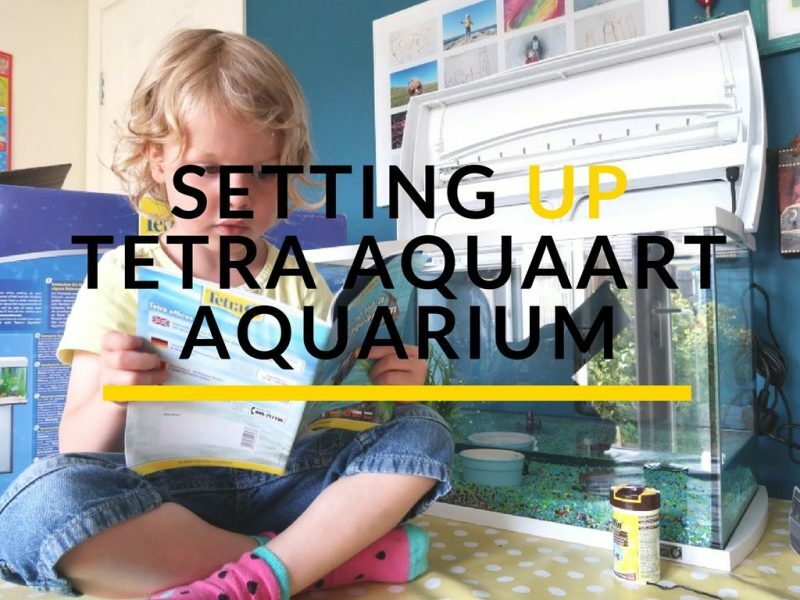 The Tetra AquaArt Discovery Aquarium comes with all the essential kit to get you started. 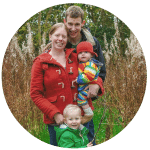 Although you will need to head down to a local aquarium shop to pick up a few bits and pieces along with your chosen fish. 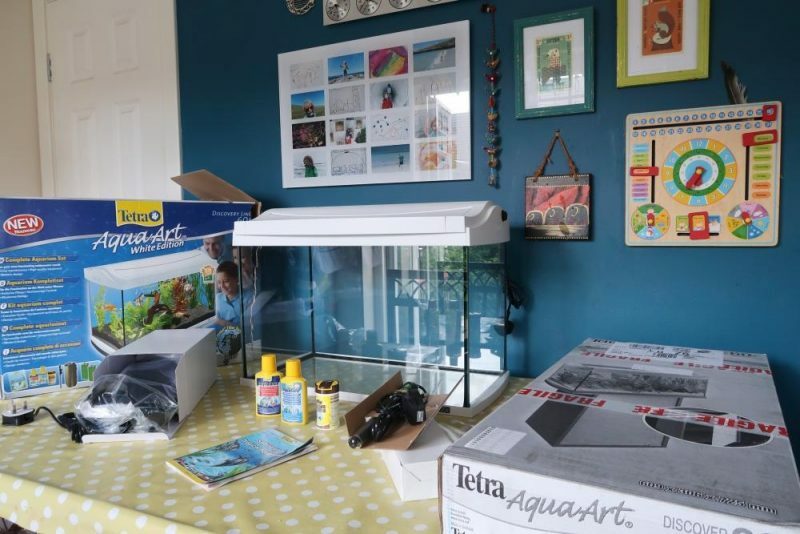 We unpacked the aquarium and within the well packed bubble wrap there was a filter, with two filter replacement cartridges, aquarium heater, long life fluorescent light, Tetra fish food, Tetra AquaSafe Water Conditioner, Tetra Easy Balance and instruction leaflet. The boys were determined to get started right away so after thoroughly reading the instructions twice and once in German for the kids entertainment we headed off to the shops. We had a look at the fish and although we were keen to buy them too, we knew that we needed to get the tank set up first. So the kids chose gravel for the base of the aquarium, multicoloured of course. 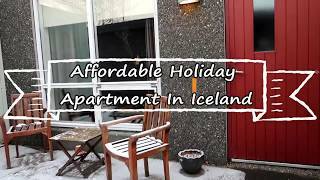 A fake plant and couple of ornaments were also added in to make it more inviting. The kids wanted to spend a ton of money on a huge pirate ship or castle, but instead we opted for a little daintier ornaments. 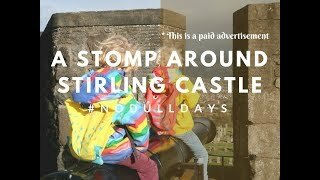 I’m pretty sure our 6 year old is planning on spending his birthday money on a pirate ship for the tank though!! The gravel and decor were added easily to the tank, hooked on the filter and heater (so easy, there are little ledges to hook it onto the edge of the tank) and plugged it in ready for big switch on. 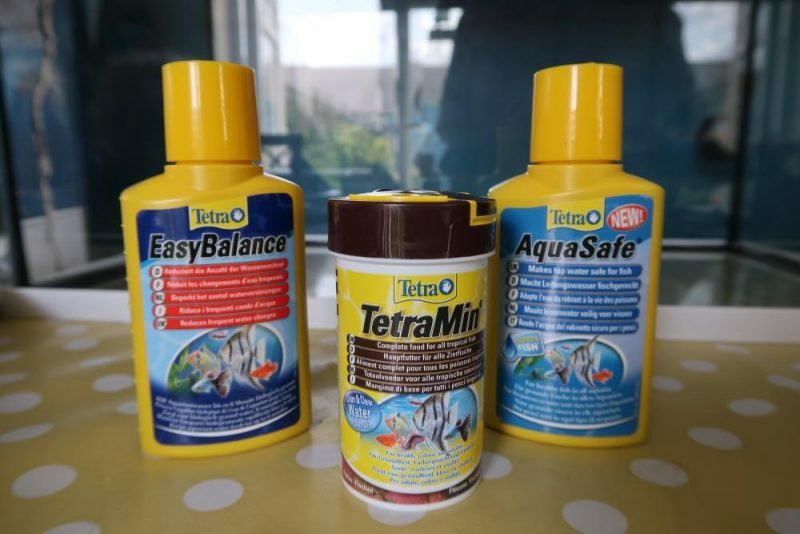 You can’t add tap water to the fish tank without first treating it, which is where the Tetra AquaSafe Water Conditioner comes in. You need to add 5ml*** per 10L of water, so we measured this out and poured the water into the tank (using a dish so we didn’t disturb the gravel, as per the instruction guide). Once it was all in we also added the Tetra Easy Balance as per the instructions on the bottle and turned on the heater and filter. Hey presto! A working aquarium! Or so we thought! The next couple of days the aquarium looked wonderfully clear and on the 3rd day we woke up to a completely cloudy tank. This completely threw us, but after much googling and chatting to a lady at the aquarium shop we were told that it was fine, the tank was ‘cycling’ and would be clear again in a few days. And they were right! On day 7 we finally were able to buy our fish and introduce them to their new home. 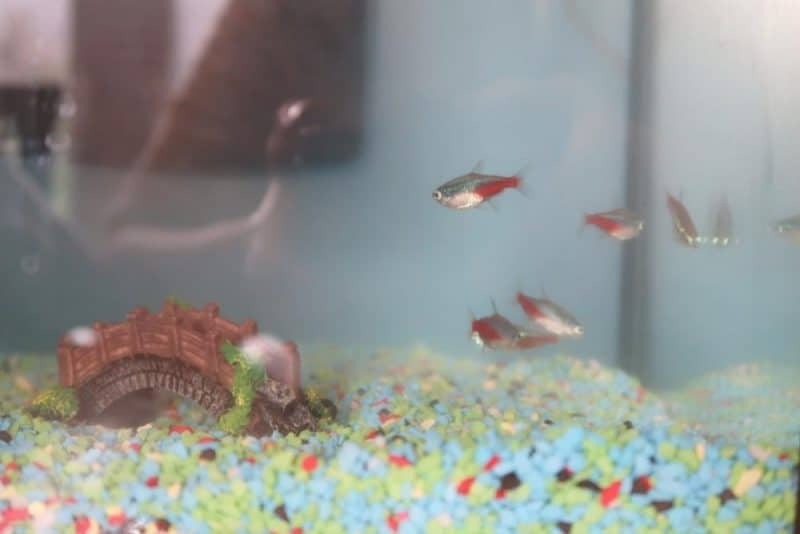 Say hello to our Neon Tetra fish, all have been named by the kids, including Dave and Jim… Ha ha! 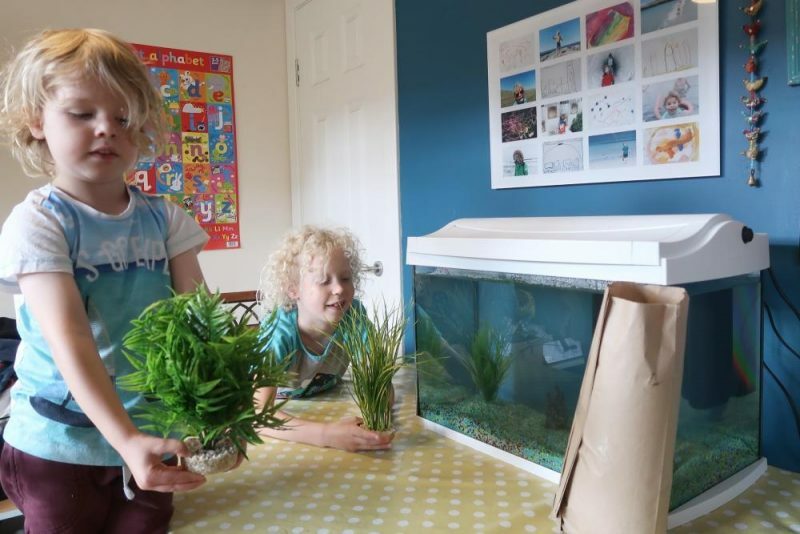 The tank looked rather bare so we also added a couple more plants, which the children helped to choose and place in the water. Adding the fish isn’t as easy as just emptying them in. Instead we followed the instructions to place the bag in the water to get them used to the temperature and gradually adding more and more water from the tank until they swam out into the tank. They seem happy in their new home and we’re looking forward to adding some other additions further along the line. Plus a pirate ship… apparently. 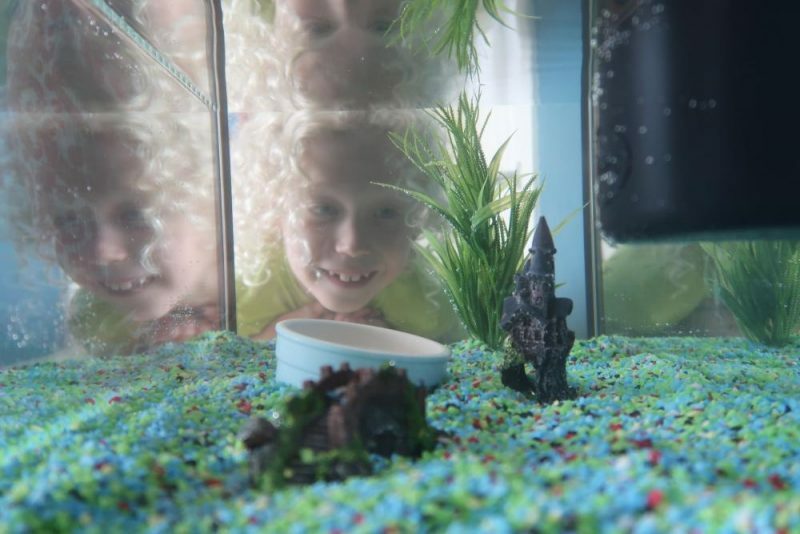 Also, if you head over to Tetra’s Facebook page you can enter a competition to win one of the children’s range of aquariums. 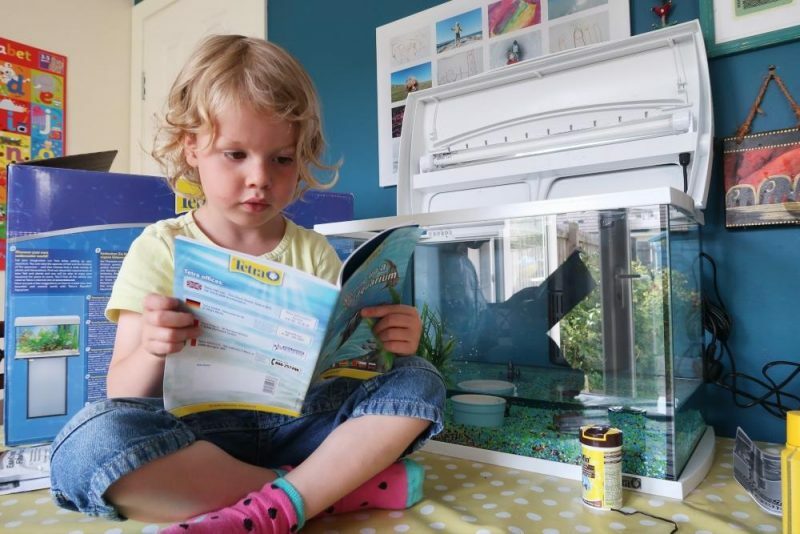 All you need to do is submit a design for a new fish friend to join the Tiny Tetra gang that feature on the children’s aquarium range. Head over here to find out more, the competition finishes on 10th August. * This is a sponsored post and we received the aquarium as part of this collaboration, however all opinions are my own. Ahh I love this, glad you have got your fish. They look fab and I love the plants. Great that the tank is so handy and comes with the stand and cupboard. 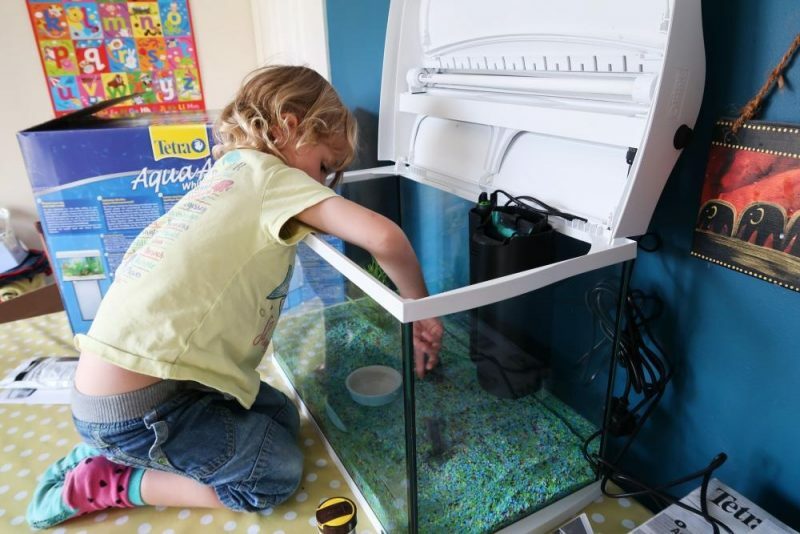 I’ve had fish for years in two seperate 30L tanks, and now I have a 2 year old daughter, she’s in love with keeping fish too! 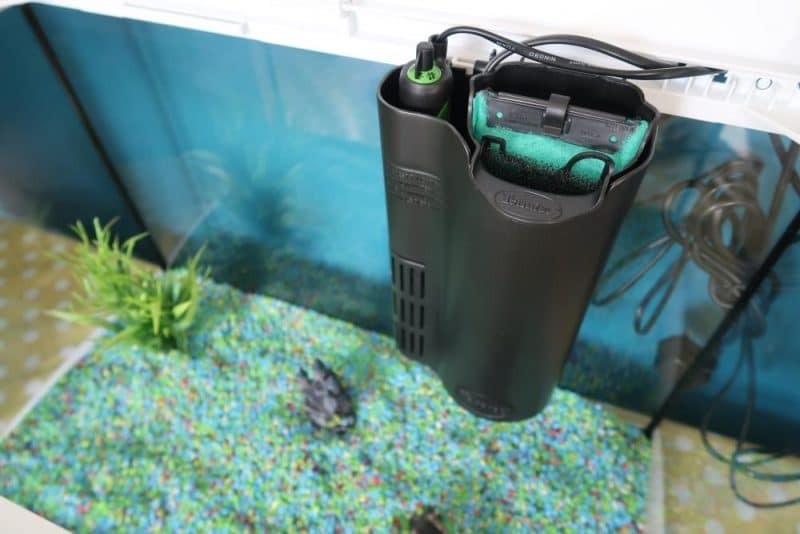 However, I’m looking for a bigger tank, and I’m looking to buy either the same aquarium/tank as you and your children, or the Tetra AquaArt LED Aquarium. I’ve looked at online reviews for both, and the LED aquarium costs £30 more, but has a blue light for night. The only negative to the LED tank that I can find, is that is doesn’t have a UK plug, so I would need to buy an adapter to go with it. Does the tank you have used here have a UK plug? Hope you are all enjoying your fish!